near the bottom of this page. God is telling us that he wants us to sing to him. God tells us multiple times in the Bible to sing to him. He even sings over us (Zephaniah 3:17). Psalm 95 says: Let us make a joyful noise. This means a happy attitude noise - which is an honoring noise of singing and speaking and perhaps even playing instruments. to focus on him during our praise and worship. This reminds us that it is not about getting in front of a church and performing for people - but focusing on God. There are a vast number of verses that speak of God as a rock. 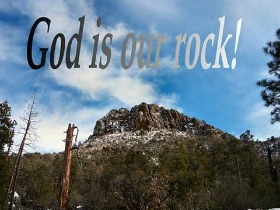 Also see Psalm 27:5 for a section on God as a Rock. I remind you that God is a Trinity. we invite you to our Psalm 18 and the Names of God page. God commands us to be a thankful people. we will become more thankful in our life. Gratitude not only draws us toward God but it draws our emotions upward and increases our daily happiness. One great way to make a joyful noise is to speak out-loud the psalms! Note that in Bible days all the psalms were put to music so it was always understood in Bible days that the psalms were musical. Psalm 95:2 reminds me of the beginning of Psalm 100. Please consider visiting our devotional page about Psalm 100. We also invite you to visit our Gratitude Prayers. Psalm 95 verses 1-2 tell us what God wants us to do. the Great One above all gods. Here we are reminded that all the earth is His - the land all the way down to the depth of the earth and all the way up to the top of the hills, and all of the sea. God created the world and he created us. are going to be accountable to that God. The Lord is worthy of our praise, our worship, and our total devotion. Note that we have a Worship section near the bottom of the page. This prayer is also posted on my Blog page. Here in verse 7, God is reminding us that he is our Maker - our Creator our Shepherd - our Sustainer. Therefore, we owe our allegiance to him. the most precious of their treasures. God draws most of us to himself with his love. they will go to hell. to surrender his life to God. he would go to hell. he tells of his conversion to Christianity. but one day he did sincerely give his life to Jesus. And soon after, he was "Surprised by Joy!" reaches out to those who rebel against him. God does this in Jeremiah. have you no respect at all for me? How can it be that you don't even tremble in my presence? can never pass those bounds. Isn't such a God to be feared and worshiped? God is worthy of respect. Unfortunately many people refuse to follow him. And we have a devotional page called The Sheep of His Pasture. You are the awesome Ruler of the Universe. You are the Merciful and Mighty One. You deserve our total devotion and praise. Keep us on fire for you. Keep your light burning brightly inside of us. Draw us ever closer to you and your will for us. 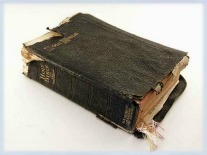 The above prayer was first presented on our blog page. God warns us against hardening our heart. A hard heart separates us from God and from others. The harder the heart against God, the more separation from God. but the entirety of our life. and certain behaviors create a tender heart. Over the years I have watched many relationships become strained and then crumble because of a hard heart (sometimes two hard hearts). That has lead me to focus on learning more about hard vs. tender hearts. God wants us to cultivate a tender, gentle heart. A tender heart is the secret to great relationships. Consider visiting our page called The Secret. Here God is reminding the Jewish people that their ancestors got to put God to the test and see his deeds. God took care of them for 40 years. Even after all that tender care, almost all of them had hard hearts that were not converted. They still lacked love for their Maker and Sustainer. God's use of the words "Forty years" helps us understand that he is referring to Moses and the children of Israel in the wilderness. Some theologians think there may have been as many as a million people with Moses. Yet take note that only a handful were truly loving God in their heart. In this psalm, God reminds us that most of those people did not truly know his heart and his ways. A true believer seeks to know God better. A true believer has a tender heart toward God. and seeks to overcome sin in his or her life. 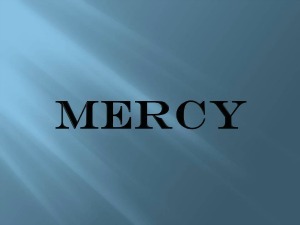 but his mercy has a limit. but he also tells us that he does not ignore lawless living. We cannot live in continual unrepentant sin. We must repent and learn to follow God's ways. The phrase "To err in our heart" sounds so unnoteworthy. It sounds like such a simple thing. But it is not a simple, insignificant thing. It reminds me of verses in Jeremiah. In Jeremiah chapter 3, God powerfully speaks to rebellious, unashamed sinners who are continuing in unrepentant sin. surely you won't be angry about such a little thing! Those verses get our attention. They remind us that God is not a pushover. He demands respect from us. our need to respect him. but is the Lord convinced? it brings on terrible consequences. Psalm 95 tells us, "They did not know my ways." God tells us in Isaiah 55:8, "My ways are not your ways." 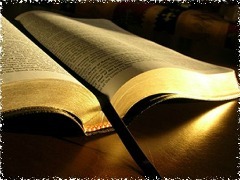 We get to know God's ways by reading the Bible. God created us to make a decision. That decision is the most important decision of our life. We are created to decide if we want to follow God and learn his ways - or not. The pure in heart SEE God. That means they understand God - they are intimate with God. It is through their seeking to obey God that they become close to him and experience the joys of deeply knowing God. we become more and more pure in our mind. We never arrive but we can make great progress. Only by learning and following the ways of God can you see God. Intimacy with God is in-to-me-see. God knows us intimately. The question is, "Do we know him intimately?" not to choose what most of their forefathers chose. God is also warning us. This psalm is for us too. 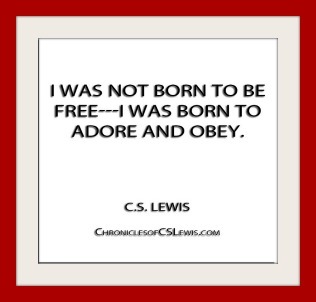 He lets us choose to disobey. Each day we have the choice to follow the Lord or not. In fact, we have that choice multiple times a day. God is making it clear that his wrath against sinful rebellion will not be quelled forever. we will be forever hindered from entering into his heavenly rest. and did not enter because of disobedience. do not harden your hearts. Some people have a hard time understanding a God of love that would one day put someone he loves in hell. Then heaven would be heaven no more. where the rebellious made life miserable for everyone. Even on earth we must punish certain forms of rebellion. and then we never punished them. What kind of awful hell would we have on earth if we did that? is really not that bad. instead of comparing themselves to the holiness of God. Let's pray fervently for our unsaved loved ones! will result in us being allowed into heaven. This life here on earth is as much of hell as we will experience. This life here is as much of heaven as they will ever experience. And when the unsaved die, they will find the fullness of hell. See our page: What is heaven and hell really like? to worship him and take him seriously. Lord, I will glorify you. I will give you glory and honor with my mouth. I will give you glory and honor with my actions. I love you, and I want to glorify you. I want to follow you in every way. Today, I will thank you for your blessings to me. Today, my mind will think on godly, righteous things. And today, my mouth will sing praise to you.